With the right preparation even the most nervous speaker can deliver a winning presentation. 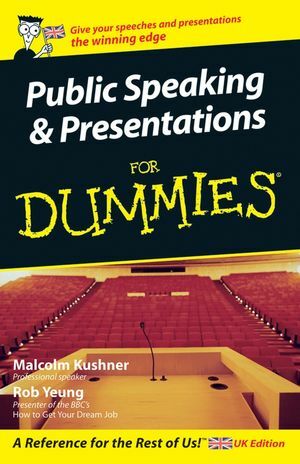 Public Speaking & Presentations For Dummies shows you how, from drafting your content to honing your tone for a perfect delivery. More confident speakers can find expert advice on getting visual aids right, impromptu speaking, dazzling in roundtables, and much more. Malcolm Kushner is a professional speaker and humourist. Rob Yeung presented BBC TV's How to Get Your Dream Job. Chapter 1: Giving a Presentation or Speech. Chapter 2: Getting Ready to Present. Chapter 4: Organising Your Presentation. Part II: Preparing Your Presentation or Speech. Chapter 5: Building the Content of Your Presentation. Chapter 6: Getting Off on the Right Foot. Chapter 7: Finishing on a High Note. Part III: Making Your Presentation or Speech Sparkle. Chapter 8: Making Sense of Your Presentation. Chapter 9: Getting the Words Right. Chapter 10: Developing Great Visual Aids. Part IV: Delivering Your Presentation or Speech. Chapter 12: Understanding Body Language. Chapter 15: Giving Impromptu Talks and Introducing Other Speakers. Chapter 16: Handling Panels and Roundtables. Chapter 18: Ten Types of Humour That Anyone Can Use. Chapter 19: Ten Things to Check Before You Give a Presentation. Chapter 20: Ten Ways to Overcome the Fear Factor.